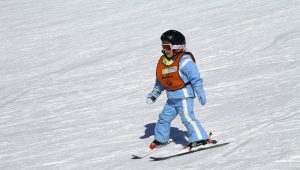 Get the most from your kids’ ski lesson! “Parents are their own worst enemy,” said Ian Burke, ski instructor at Big Sky in Montana and formerly Sunday River in Maine. Ian’s my son, he started teaching skiing at the age of 16, I started ski instructing at age 17 at Smugglers Notch in Vermont, like my mom did at Gunstock in New Hampshire. It’s a family ski tradition for it seems. your kid to participate (and not pout like they do with Mom & Dad). As a parent, I understand that it’s hard to let go of your pride and joy, entrusting a complete stranger with your bundle. But when you fork over a hundred bucks for a ski lesson, don’t be a “smother”, hand over your child with your trust and get your money’s worth. Prepare your child ahead of time that Mom and Dad will be taking them to ski camp, explaining that Mom and Dad will not be staying. Present the day of adventure in a positive light, as a snow play date. Tell them about the fun day ahead of learning to ski and making new friends at ski camp. Don’t surprise them with the ski lesson last minute and don’t disappear when they’re not looking– kids are just little people, they are not stupid. And don’t make a prolonged goodbye at drop off either, that just makes it harder on everyone (the instructors included). Pay the Dough, ski lessons and all day camps are pricey, because they are worth it! Your child will receive professional instruction with an emphasis on safety (priceless). 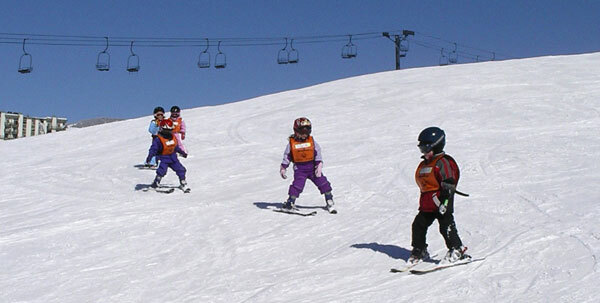 Instructors are trained to create a fun learning environment –something that can’t develop with POS – code for “parent over shoulder.” Another key to success is that your child is with similar sized new skiers –peer mentoring occurs too, but not with helicopter parents hovering.